Sorry it has been a few weeks since I posted progress on this panel. I’ve had two very large commissions going at the same time so my progress has slowed a bit. The good news is that I am grateful to have an apprentice working with me on this project and the other commission work so we are hoping to see this panel finished in the next week. Here is one of the figures that is almost complete. Stay tuned for the final shots. In another day of work I should have the remaining rocks and background elements painted and I can focus on the figures. I have been working pretty consistently on this panel since Christmas. I think that in another week I may be able to finish it so I can get started on the next panel. Below is a shot of my studio as of January 5, 2019. It has been a few weeks since I’ve had the chance to work on Canto 7: The Avaricious and the Prodigal. Over the Christmas season I completed over 16 commissions for the holidays. Now that Christmas is here I’m diving back in with the hopes of completing this painting by 2019. I had hoped to finish 10 paintings this year but since I had to take on so many commissions to keep this project and my household going I’m only finishing 2018 with 4. I will, once again, dive back in this year with the hopes of finishing 12 paintings in 2019. Though I have some very large commission pieces in the early part of 2019 I will be working with an apprentice this winter so I am hopeful I can pick up the pace. Here are some photos from December 25 and 26th. Here is a detail shot of “Plutus” from my new panel for Canto 7. This figure was a real pleasure to paint. I loved painting all of the intricate hairs and the eyes on this model. I am so lucky to have found someone to pose for this character. He was fantastic and that makes all the difference in the end. I hope you enjoy this panel as much as I do. I’m working on the next panel for Canto 9 and I should have a composition finished in the next few days. After a few weeks of finishing commissions, writing a review of materials for Jerry’s Artarama and conducting a few week-long painting workshops I’m back to working on Canto 7. I spent the last week working on finishing all of the surrounding rock formations on the panel. The background took about three days to finish and the foreground rocks were finished in about three days as well. I am excited to getting back to painting the remaining characters in the painting. Last night I roughed in the face of Virgil and I will be doing the same for Dante tomorrow. The only remaining items to work on will be the robes for both characters and the hand and arms of Plutus. Fortunately the face of Plutus is finished so the hardest work has already been completed. I’m really hoping to finish the painting by the middle of next week. Wish me luck! Even though this painting isn't technically part of the Dante's Inferno series I wanted to make everyone aware of this beautiful new addition to my inventory. Sales of all my work help me to fund this project which is being funded entirely by the sales of my paintings and the generous support of some of the patrons and sponsors which have helped me get this series started. I still need your support to help me finish all of the work I need to do the next three years so if you'd like to help me bring this project to life you can visit my SUPPORT THE PROJECT page or visit my store to purchase a print, a book or an original piece of art just like this painting. Thank you so much! Dante Series Mentioned in Fine Art Connoisseur Magazine! 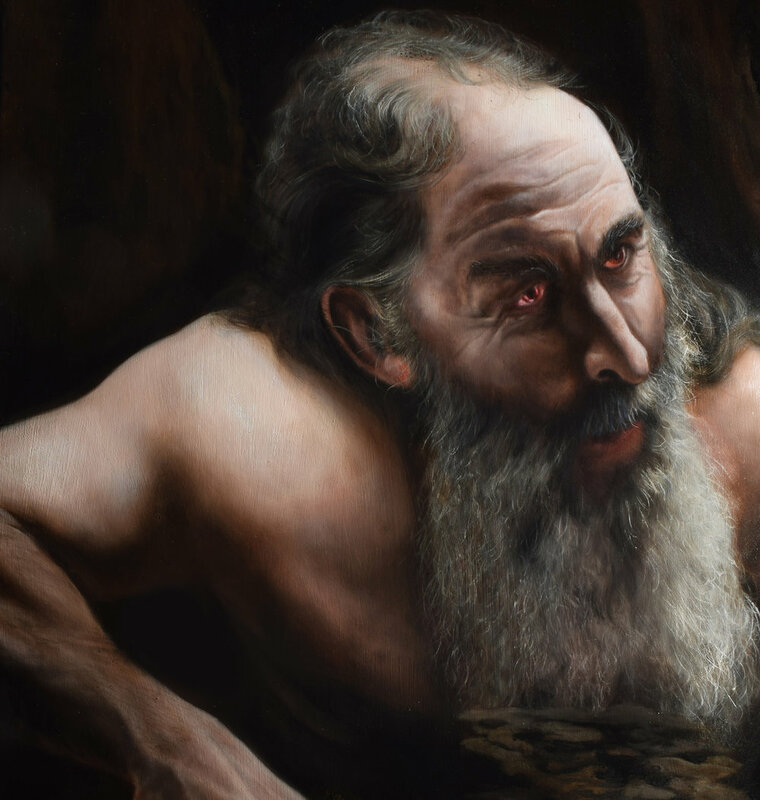 We weren't aware until last night but Eric's Dante's Inferno painting series is featured in the April edition of Fine Art Connoisseur Magazine in an article - Towards A New Hierarchy of Art. Check out this 5 minute video painting the hair of Plutus from Canto 7. I worked for six hours this past Thursday on the beard and hair of this figure and I'm happy to be moving onto the rest of the painting. Things are progressing really well and at a fast pace. I roughed in the rest of the background with some burnt umber. I am planning to do another pass on the rocks in the background this weekend. If all works well I should be finished with this inferno painting by mid August! Here is a close up of the face of Plutus from Canto 7 after my fourth pass last night. If you'd like to see a video of last night's session check out my instagram page. I've posted my new video for my Dante's Inferno painting series, Canto 5: King Minos, Judge of the Damned. This video is a behind the scenes look at the painting process over the previous 8 weeks I painted it. I hope that you will continue to enjoy this video series as I paint each of the stages of hell in the Inferno. Day 1 - working on the painting for about 4 hours tonight. Had to stop around 1:30AM to sleep. It took me two sittings to get the composition together but it is now ready to be painted. I'm really excited to paint the face of Plutus so I am probably going to attack that area of the painting first. Stay tuned for more! Just hours after finishing Panel 6: Canto V: King Minos, Judge of the Damned, my next AlumaComp panel is primed, sanded and ready to paint Plutus! I will be starting this evening! Here is a detail of the imposing figure of King Minos. This was a fantastic figure to paint and it was my desire to have him at the focal point of the composition. You can see in the distance the mass of condemned souls being ushered behind him to be judged by a group of demons into the second circle of hell. The mass will culminate in a line in front of Minos. As a viewer, you have the feeling of being both in the position of Dante and Virgil and the souls in line waiting their turn. The composition also utilizes a "circle-like" formation of that line of souls emphasizing the second circle of hell and the circular, serpentine nature of the tail of King Minos which will determine the fate of each soul. 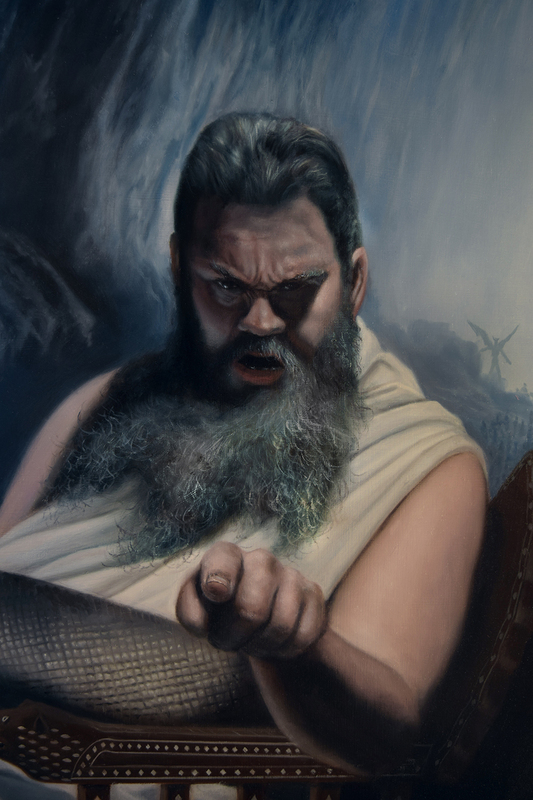 Panel 6, Canto 5: King Minos, Judge of the Damned, oil on AlumaComp, 48 x 60" is finished! I will be posting more detail photos tomorrow! I am within days of finishing panel 6, Canto 5: Minos, Judge of the Damned. I've finished the background, the demon and the soul being dragged up the stairs as well as the body of Minos. The serpent tail of Minos took an especially long time to make sure the pattern of the snake and the highlights were all attended to painting-wise. It was a lot of fun. All I need to do yet is the figures of Dante and Virgil and the chair below Minos. This is going to be a really dramatic painting and I can't wait to finish it. One final element I have to add yet is going to be a steady flow of souls being ushered down into hell by demons in the background on the left and right of Minos way in the distance. I hope this painting of King Minos will be one of the best representations of him in the Inferno. I painted another one of the figures last night for Canto 5: Minos, Judge of the Damned. This soul is being pulled up the stairs by the demon on the left side. If you look closely you can see them clawing at the slimy black staircase. With this figure finished I am now ready to finish Minos and then the backs of Dante and Virgil which should be easy. The hardest part will be the medieval chair under Minos and the parade of souls in the distance that I am planning to paint.